This sale excites me! I have used patterns from some of these designers and they sew out great. Wonderful bargain for those that sew or want to give sewing a try. Begins 8AM Monday Morning! Today is the 1st day of the 1st ever Sew Fab e-Pattern Bundle Sale and giveaway, sponsored by The Southern Institute and Fat Quarter Shop! Over the past eight weeks a lot of behind the scenes work has taken place to bring you this amazing bundle of ePatterns from several of the top pattern designers and bloggers in the sewing and blogging world. The result is a bundle of 18 PDF sewing patterns that you don’t want to miss. For one week only, ten pattern designers have come together to bring you 18 of their best PDF patterns, valued together at over $139.00, for the incredible price of $24.95! That’s over 80% off of the combined retail value! Plus you can enter to win a dream of a giveaway valued at $390 from some really great shops! For less than $25.00 you will have a library of resources that you can use over and over again. The designers that have joined this sale are experts in their craft. They have been sewing for a very long time and are well known in blogland and elsewhere. Each designer has contributed one or two of their favorite patterns to create a bundle that is sure to please! Whether you are sewing for your own family or making gifts for others, these are patterns that you will love to use. If you’ve never sewn with a PDF pattern before, let me tell you how great it is! After downloading your pattern instructions and your pattern, you will print out the pattern itself, creating pattern tiles, if you will. Simply tape the tiles together to create the full pattern! At that point you can cut out the size that you need and pin the paper pattern directly to your fabric or you can trace the pattern size that you need onto sewing paper or tissue paper and cut it out, saving the paper pattern for later when you need to sew another size. Pdf patterns are so convenient because you can print them out as many times as you need! Click here to buy the bundle! Now let me tell you a little bit about the giveaway! The Sew Fab Giveaway is amazing! One lucky winner will win a bunch of amazing prizes from Craftsy, Fat Quarter Shop, fabricworm, Jennifer’s Jewels Custom Labels on Etsy, Green Bee Patterns, author Deborah Moebes, Mee a Bee, Gussy Sews, I’m Feeling Crafty, and Ball and Chain on Etsy. See the end of the post for giveaway details. This giveaway is not to be missed! 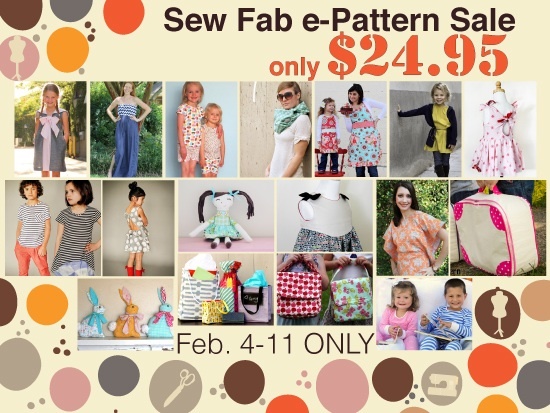 The Sew Fab e-Pattern Bundle is only available for one week and will never be available again! You can purchase the bundle from February 4th at 8 a.m. EST through February 11th at 8 a.m. EST and there will be no late sales offered. Due to the nature of the sale there will be no refunds offered. You don’t want to miss this unique opportunity to purchase a ready made collection of 18 PDF sewing patterns from 10 of the best designers out there! And now for The Sew Fab Giveaway! YES, ONE WINNER WILL WIN ALL OF THOSE GOODIES!!! There are lots of chances to win and no purchase required to enter the giveaway. Just use the Rafflecopter widget and enter to win this amazing prize package that will inspire you in your sewing as well as keep you stocked with fabric for many projects to come! The Sew Fab e-Pattern Bundle Sale! Graphic design by Andrea Panell.